Competitive Employment – CHI Centers, Inc.
CHI gets to know each individual through a ‘discovery process,’ which informs staff of skills, challenges, and other aspects important to job choice and success. Job developers then help each individual find and keep jobs in the community. Job coaches work with employee and supervisor to ensure expectations are understood and met. When Kevin Todd came to CHI Inc. in July 2014, he started in the Day program working on various contract jobs within CHI’s facility and was paid a few cents an item for his work. Kevin later enrolled in CHI’s food service training program, where he was still paid an hourly rate less than the minimum wage working in the cafeteria. 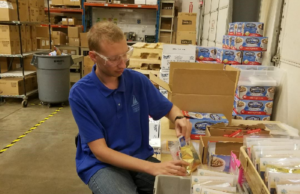 After CHI informed the Chesapeake Bay Roasting Company the agency was no longer going to operate subminimum wage contract work, the company agreed to consider hiring a person supported by CHI to work at their warehouse in Crofton. Kevin, who lives in Bowie, was hired by Chesapeake in September, and CHI provided on-site job coaching supports. In a short time, Kevin’s productivity and accuracy were the same as other company employees. At this job, Kevin earns $10 an hour, which is 75 cents more than the minimum wage in Anne Arundel County. That’s a huge success in just a short time – for Kevin and for our community. CHI was there at every step, helping support Kevin’s job skills and his evolution as an independent employee. That’s success of which we all can be proud. For persons seeking competitive employment please call us at 301-445-3350 or email us at info@chicenters.org.